Denny Charbonnet celebrates a successful GODSPELL showing with her daughter and choreographer/costume designer, Elise Angelette. (Photo by David McDonnel, used with permission). (COVINGTON, LA) Denny Charbonnet, director of the SPS Drama Program, otherwise known as the Marian Players, directed the final show of her 31-year career last Sunday, March 25. 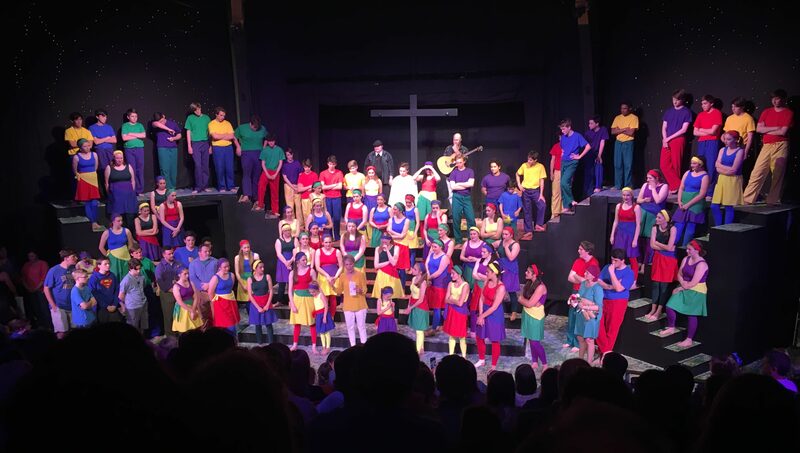 This year’s spring production, “GODSPELL“, is Charbonnet’s favorite production to direct, which explains why this is the seventh time SPS has seen GODSPELL during the Charbonnet era. Denny Charbonnet was President Brother Ray Bulliard, FSC’s, first hire as principal of SPS in 1987. She has been a long standing part of the SPS and local community ever since. After the final scene of GODSPELL, the cast and crew became highly swept up in emotions. So many members were weeping at the thought of Charbonnet’s retirement, that her grandson, Jude, went around the cast with a full box of tissues. Charbonnet says that this stage production was her last for SPS, but she plans to continue teaching and performing drama elsewhere in the community. The new SPS Drama Program Director has yet to be announced, but Charbonnet is hopeful for the future of the program, which has been around far before her era. And although GODSPELL was Charbonnet’s final full stage production at St. Paul’s, she states that she does hope to return to campus each year to produce the annual “Passion Play” for students during Holy Week. This year’s Passion Play will be performed tonight (March 27) for the public in the Briggs Assembly Center at 7 p.m. and for students tomorrow (March 28) during the school day. First year 1987-1988 school year; this year is the 2017-2018 school year making Ms Charbonnet’s tenure that of 30 years, not 31. According the head of our Math Department, 31 is the correct number since she taught both ’87-’88 and ’17-’18.